This is one of the scenic backdrops they built that was used at Art Outside. I just love it! “Community Art Makers” was one of the Black Rock Arts Foundation’s 2010 grant recipients. They are Austin, Texas based community leaders offering work and meeting space, guidance and assistance to artists endeavoring to engage their community. 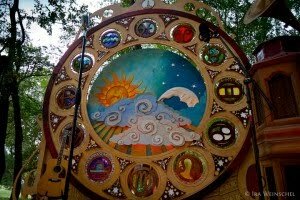 Former notable projects have included recently showcasing the 32 foot tall fire tornado from the BRC ‘Fire of Fires’ Temple for a public audience of thousands, and the first public burn night on NYE, 2009 of the Resolution Clock in the center of Austin, Texas for 100,000 people. BRAF’s infrastructure investment will allow the Community Art Makers to build upon current resources and offer more structured resources and work space for artists. Their upcoming projects are focused on artist empowerment and community building. Some of these projects for 2010 include partnerships with the City of Austin Library, Parks and Art in Public Places Departments, ‘Art Outside’ and ‘First Night’ pieces that showcase interactivity to a public audience and hands on classes and training for trained and aspiring artists. Thanks to the continued generosity of the Black Rock Arts Foundation , we have nearly completed a 400 SF studio space renovation at our North Austin Compound. This weekend we should be finished renovating our very own glass studio! Our space will be equipped with tools for creating stained glass, fusing and also slumping glass. Need some space to create? Want to learn? Drop us a line and get involved!